The McLouis Fusion next stop NEC motorhome show. Yes, where next for this blockbuster of a motorhome from Italy? Well, the main event is going to be focused on displaying a McLouis Fusion motorhome. That McLouis Fusion will be demonstrated on the NEC site, by McLouis Fusion dealer Nick Whale motorhomes. Having, been to Manchester and Glasgow, with great reports of interest and sales, it is Birmingham next! Have you been looking for a fixed bed model, with an end garage? Need a 4 berth motorhome? Travelling seats for 5 people with seatbelts? Look no further the McLouis Fusion, is here now. Ticking all those boxes, on most models! The McLouis Fusion 311 has 4 seat belts, the other 4 has 5! All 4 berths and end garages. What may you expect, of the McLouis Fusion next stop NEC motorhome show. An exclusive motorhome range, from Auto-Sleeper motorhomes. Well people are telling us, it is a number of things, that are very appealing. So, here is your chance, to take a closer look at what is on offer. First of all a special offer of a limited time offer of a free lux pack! That provides a whopping £2,500. FREE give away, featuring; remis cab blinds, Thule awning canopy, reversing camera and removable carpets. Now don’t stop there. Many are saying these McLouis Fusion motorhomes, are just great value for money. With the downgrade option of chassis. That allows the McLouis Fusion motorhomes, to be driven on a standard UK driving license. Manchester was a great launch event attended by the Go European McLouis Fusion dealers. People flocked to see and ask questions about these excellent Italian motorhomes. It may have been quite a shock, to see the McLouis Fusion at such value for money. 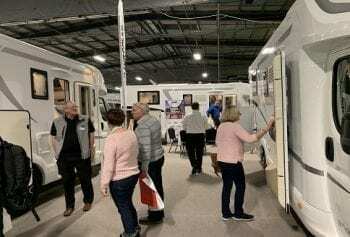 Glasgow provided our McLouis Fusion dealers B C Motorhomes, with an excellent venue. There was no doubt that the McLouis Fusion certainly provided many answers, to questions. That Italian motorhomes style, has captured peoples motorhome aspirations.